We are just about a week away from the beginning of the 2016 season. With 34 tournaments on the schedule (including the International Crown), this year promises to to be one of the most exciting ever. In past years, when doing my predictions, I have picked my top 30 players. Because of the incredible increase in talented players on the LPGA tour in recent years, I am now going to increase my picks to the top 40 players. Even with the increase of ten players, I find that I am leaving off some highly talented players. I am strictly going by where I predict they will finish on the 2016 money list. 1- Lydia Ko (1) - How can you bet against this girl? She won just about every major award last year and is the Rolex Rankings #1 player in the world. Unless she loses some motivation, and I can't see that happening at her age, she will still be on top at year's end. 2- Inbee Park - (2) - I am not going out on a limb here either. She knows how to win, and she knows how to win big tournaments. She finished #2 in each of the past 2 seasons. I believe there will be multiple wins, and another major championship. I also believe she is destined to finish #2 again. 3- Lexi Thompson - (5) - From tee to green there was not a better player on the LPGA tour in 2015. That statement is backed up by the fact that she led the tour in Greens in Regulation. For a player that is as long as Lexi is off the tee, that is an amazing statistic. Her achilles heel has always been her putting. She was #37 on tour in putts per G.I.R. (Stacy Lewis was #1, Lydia Ko #2, Inbee Park #3). If she can improve in this area she will become the #1 American player, and could eventually be a threat to top the Rolex Rankings. Is this the year that Lexi Thompson challenges for the top spot? 4- Stacy Lewis - (3) - Led the tour in putts per G.I.R. in 2015, and is still one of the best ball strikers on tour. The question now is: Has she forgotten how to win? She found herself on top of the leader board several times last year but always found a way to come up short. She had six 2nd place finishes. I predict she will win at least once in 2016, but will drop a spot on the money list. 5- Hyo Joo Kim - (13) - After a terrific first 2/3 of the the 2015 season, Hyo Joo tailed off a bit at the end. Since it was her rookie season, and being away from home for the first time, this was not unexpected. Not that she needs extra motivation, but as of this writing she is the #5 ranked golfer from South Korea in the Rolex Rankings and needs to get to #4 to qualify for the International Crown. Loaded with talent, I look for her to be a top 5 player this year. 6- Sei Young Kim - (4) - She surprised even her most devout fans last year. That said, I want to see her do it a second time. She got some favorable bounces at the right time, but also seemed to play her best golf at big tournaments. Not ready to rank her ahead of Hyo Joo just yet. Can she repeat last year's success? Yes, I think she will, but I still have to drop her a couple of spots. 7- Shanshan Feng - (9) - I would like to put her higher on this list but I can't for the simple reason that she does not play in enough tournaments. She's one of the best players on tour but she can not spot the best players in the world 5 or 6 starts and expect to finish ahead of them on the money list. 8- Minjee Lee - (16) - She was good last year. Real good! I can't help but think that we haven't seen her best yet. I expect a breakout year in 2015. 9- Brooke Henderson - (N/A) I know some of the boards are going to light up with me placing her this high. I just believe that she is that good. In just 14 starts last year (most as a non LPGA member), she made the equivalent of the 18th place finisher on the money list. What could she have done with 30 starts? This will be Brooke Henderson's first full season....and the sky is the limit! 10- Amy Yang - (6) - Amy had what was in my opinion her best season ever in 2015. There were times when she looked as good as anyone on tour. She still tends to struggle for long periods of time, but when she's on she is really on. I don't like dropping her back this far, but this tour is so loaded with talent that this is not an insult. 11- Suzann Pettersen - (14) - Her back problems seem to make it impossible for her to make it through an entire season healthy. That said, I am thinking that there are many players playing through pain that we don't even know about. She has never won as much as we expected her to, but she is always a threat to win. She will win again this year and finish right about here. 12- Anna Nordqvist - (10) - There is nothing about her game that jumps out at you. She does nothing spectacular, but does everything well. Always consistent, you could bet on her finishing around this spot every year. 13- Mirim Lee - (19) - A solid year but a few steps backward from her rookie season in 2014. She will bounce back into the winner's circle this year, and move up 6 spots. 14- Ha Na Jang - (15) - She did everything you could have asked of her last year but win. Always smiling and impossible not to like. Look for her to get that first LPGA victory and move up a spot. 15- So Yeon Ryu - (8) - Been sitting here trying to move her up on this list and I honestly can't. As good as she is, she has such a hard time finishing on Sunday. I don't think her level of play has diminished, I just think some of these "young guns" have just blown past her. 16- Jessica Korda - (27) - It was not a good 2015 for Jessica. She fell 11 places on the money list all the way down to #27. But winning is what this is all about, and every time you begin to write her off she sneaks up the leaderboard and the next thing you know she's holding the winner's trophy. She is currently fighting for a spot on the International Crown team, which should bring extra motivation. She has all the tools and I look for her to regain those 11 spots. 17- Alison Lee - (23) - Another player I wish I can rate higher, but she has to show me that she can win. She has made a surge to get onto the U.S. International Crown team, but still has work to do to get there. An early win would be nice. But until that happens I can't rate her higher than this. 18- Cristie Kerr - (7) - Ended the 2015 LPGA season with a win at the CME Tour Championship. It was her 2nd victory of the season. She is on a mission to get the 27 points needed for induction in the Hall of Fame. She probably won't get there, but don't tell her that. Still very dangerous, but I look for a bit of a dropoff this year. 19- Morgan Pressel - (11) - IMO the comeback player of the year in 2015. She was in contention several times, but could never finish. I'm looking for another solid year. 20- Charley Hull - (48) - Was just a part time player last year teeing it up just 14 times. She promises to play a full season on the LPGA tour in 2016. If she is as good as I think, she could challenge Suzann Pettersen for the title of Europe's best player. 21 - Brittany Lincicome - (12) - Another player fighting to hold onto her International Crown spot which she has by a very small margin. With a major championship win in 2015, she still seems to have something left in the tank. 22- In Gee Chun - (N/A) - The defending U.S. Open champion should have no trouble winning the Rolex Rookie of the Year award in 2016. She had eight starts on the LPGA tour as a non member last year, but beside that one incredible win, the results were very mediocre. Not sure if she is going to be last year's Hyo Joo or Q-Baek. So I stuck her in the middle. 23- Na Yeon Choi - (17) - It was a strange year for NYC in 2015. She did win twice, but fell 4 places from her 2014 money list placement when she did not win at all. She has a history of being consistent but not finishing well enough on Sunday. Last year she finished well but was not consistent at all. She will need to show up more often to keep up with the players I have ranked ahead of her. 24- Chella Choi - (20) - Almost a carbon copy of NYC above. Chella got her first LPGA win in 2015, but fell from #10 to #20 on the money list. 25- Jenny Shin - (26) - Plays well in streaks, and then disappears for long periods of time. She slipped 5 places on the money list last year, but still only 23 years old, I expect that slide to come to an end this coming season. 26- Azahara Munoz - (32) - This recently married Spanish star missed a part of the 2015 season when she had surgery on her hand. Always a consistent performer, she still has not won a stroke play tournament. She will need to get off to a great start if the Spanish team is to have any chance of qualifying for the International Crown. 27- Yani Tseng - (21) - It was a big comeback year for Yani in 2015. Although she did not win, she came close several times, and moved up from # 54 to #21 on the money list. That said, I still think she is miles away from the player she used to be. The LPGA lists 148 players in their rankings for driving accuracy. Yani ranked #147. That must improve before I can even consider moving her up further than this. 28- Michelle Wie - (49) - It was a nightmare of a season for Michelle in 2015. After finishing #4 on the money list in 2014, she fell all the way to #49. Injuries can sure be used as an excuse for her not having a single top 10 finish, but she seems to injure easily. She wears tape in so many places, she could be nicknamed "The Mummy". She is still very young, and I believe she will have a better year in 2016. How could it be worse? 29- Gerina Piller - (18) - Gerina had her best year in 2015. That putt she made to lead team USA to victory seemed to ignite her second half. She missed winning the Year ending CME Tour Championship by 1 stroke. I would like to put her higher, but she has to show me a trophy first. Is this the year Gerina Piller breaks through for that first LPGA victory? 30- Mi Hyang Lee - (22) - I could be very, very wrong on this one. If things fall into place for her, she could finish 15 places higher. 31- Jaye Marie Green - (58) - My surprise pick of the year! Jaye finished the year 2015 as one of the hottest golfers on tour. She had 3 top tens and 5 top twenties in her last 9 starts. She jumped from #93 on the 2014 money list to #58 in 2015. I look for her to continue to rise quickly, and be a member of the next USA Solheim Cup team. 32- Ariya Jutanugarn - (35) - Has the game to become one of the best players in the world. She is also capable of missing 9 consecutive cuts, as she did this past season. Like Yani Tseng, keeping the ball in the fairway is her biggest problem. Which direction will her game go in this year? I have no idea. So I put her here. 33- Angela Stanford - (34) - No longer the consistent top ten performer she was in previous years. Her opportunities to win don't come that often anymore, but I am not ready to put her out of my top 40 yet. I believe this will be a pivotal year for her. 34- Kim Kaufman - (45) - I got a number of comments last year questioning how I could put her on my list. Well I am doing it again. One of the hardest workers on tour, Kim made big strides in 2015, jumping from #58 to #45 on the money list. Look for more improvement in 2016. 35 - Karrie Webb - (43) - Karrie had her most disappointing year in quite some time in 2015. She never seemed to get on track, and dropped from #8 to #43 on the money list. Is her age now becoming a factor? Maybe, but I still think she's got something left in the tank. 36- Xi Yu Lin - (39) - A real dark horse here. Have not seen her as much as most of the other players on this list, but she was one of the most improved players on the LPGA tour in 2015. I see her moving up a few more spots this coming season. 37- Mika Miyazato - (28) - A big comeback year in 2015 as she played more like the player we were used to seeing as opposed to her 2014 season. Look for her to have a solid, if not spectacular, year in 2016. 38- Ilhee Lee - (24) - IMO the most streaky player on the LPGA tour. She has streaks where she plays like a top ten player, but then will disappear completely for very long stretches. Her inconsistency makes her placement difficult. 39 - Austin Ernst - (33) - A solid player who had her best year in 2015, moving up 8 spots to the #33 position. I want to see her win before I put her higher than this. That said, I expect another solid season. 40- Paula Creamer - (47) - I left her off this list originally, but changed my mind at the last minute. She has very little chance of making either the International Crown or Olympic teams (unlike many other players fighting for spots), leading me to question how motivated she will be coming out of the gate in 2016. The Pink Panther has been such a big part of the LPGA for so long, and I am not yet willing to write her off completely. Players that could be the biggest surprises of the season: Megan Khang and Annie Park. Feel free to add your own picks and opinions in the comment section of this blog. Solid picks. I would add as dark horses (sentimental picks) Megan Khang, Kelly Shon, and Maude-Aimee Leblanc. I won't be surprised if young Brooke Henderson finishes even higher than 8th... which would be a huge achievement in itself. I also think Brooke Henderson will finish higher than 9th. If she plays as well as she did last year she could be top 5. 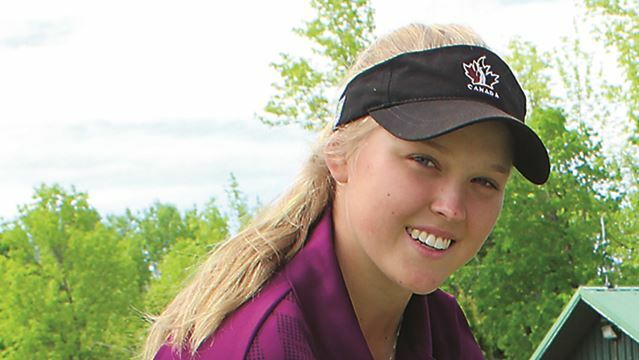 Brooke Henderson - What could she have done with 30 starts? She would have won at least 2 x $761,558 = $1,523,116 and should be #5 or better in 2016! I wouldn't be surprised to see Brooke win a major this year. If she does, look out, the sky's the limit. I think you underestimate In Gee Chun. She may only have won once on the LPGA last year but that was the USWO. She didn't get her top ten Rolex ranking based on one event. Don't forget she also won majors on the KLPGA and JLPGA last year. Flying in from Asia to play one event is very difficult. She won't be handicapped by that this year. I appreciate the effort it takes to put these predictions together and to put those predictions out there to be scrutinized. I would like to see the writers and commentators at GC do the same. But they won't. And the won't revisit their picks at the end of the year to see how they did like you will. Again, thanks. You could very well be right regarding In Gee. There are so many great women golfers now it's hard to put all of them in the top 15. I have to agree with Sports medic being an In-Gee follower. She will have her struggles at first getting acclimated to the rookie role, playing unfamiliar courses and surroundings. But once she gets into a comfort zone, I predict she will win on the tour this year. IMHO In-Gee's a better player than Hyo or Q.